Martin Luther King, Medgar Evers, George Washington Carver, and Jackie Robinson are all names synonymous with the advancement of African-American culture. In the face of bigotry and segregation, their achievements are landmarks in the annals of mankind’s existence. Yet their accomplishments pale in comparison to another man, whose own degradation in the face of discrimination never kept him from striving to perfect the medical milestones that touched the lives of millions around the world. As a young man of nineteen, Vivien Thomas dreamed of becoming a doctor. The son of a carpenter, he saw his dream vanish along with the college tuition it took him seven years to save, in the stock market crash of 1929. Undaunted by his dilemma, he accepted a job at Vanderbilt University as a technical assistant to a pioneering young doctor named Alfred Blalock. Blalock was quick to recognize in Thomas, the talents needed to assist him in his quest to solve some of medicine’s greatest mysteries. And although Thomas would be slighted in the Vanderbilt employments records by being listed as a ‘janitor’, he nevertheless grasped the opportunity that lay before him and forged a partnership that has never been matched in the history of medicine. Their first breakthrough came in the early forties, when they discovered the method for stabilizing a patient that had gone into ‘shock’ either during an operation or from catastrophic injury. In World War II alone, this discovery would save the lives of millions of soldiers who were wounded on the battlefield. With the prestige that this discovery brought him, Blalock accepted a position as Chief Surgeon at Johns Hopkins University in Baltimore. He convinced Thomas to move north with him so that they could continue their groundbreaking research. Thomas’s treatment in Maryland was no different from the Tom Crow south he had just left, as segregation was also deeply entrenched in the social aspects of Maryland society too. While Blalock tended to his administrative and teaching duties, Thomas took on more of the responsibilities associated with Blalock’s research. Their next challenge was handed to them by a young female pediatrician named Helen Taussig. Every year scores of infants were born with a congenital heart defect, which deprived their blood of the oxygen needed for sustaining life. Coined ‘Blue Babies’ for the blue colored tinge to their extremities, they rarely lived past infancy as they slowly suffocated as they grew in size. Blalock and Thomas theorized that by grafting an arterial ‘shunt’ between the heart and lungs, enough oxygen would be supplanted in the infant’s blood to maintain life. After many failures with their radical technique on research dogs, Thomas deduced what the underlying problem was and successfully operated on a dog named Anna. With the success of this first operation, Blalock felt ready to try the procedure on a living human. With Thomas standing on a stool overlooking his right shoulder guiding him through the process, Blalock performed the life-saving operation successfully on a young baby girl. Word spread fast of the groundbreaking operation and scores of parents with sick children and physicians from around the world, came to Johns Hopkins to be treated or to learn the new technique. Blalock received all the accolades that come with pioneering inventive processes, while Thomas’ abundant contributions to the operational technique were noticeably overlooked. He would continue to invent new procedures and methods in surgery over the next few decades and would finally be honored with an honorary Doctor of Law award from John Hopkins just before his retirement. His is a story of amazing accomplishment shaded by a cloud of prejudice and segregation. Maybe this environment helped to instill in him a desire to strive for perfection and hopefully break down the segregated walls imposed by his peers. 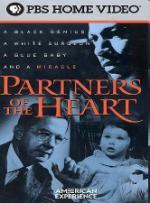 Partners of the Heart is a documentary that every school child should see sometime in their curriculum, and would make an interesting double feature with HBO’s dramatization of these events in Something the Lord Made.